Daily Truthbase: Luke 18-21 Will You Be Considered Worthy? Ps 119:129 PE “Your testimonies are wonderful, therefore my soul keeps them. 130 The entrance of your words gives light. It gives understanding to the simple. 131 I opened my mouth wide and panted, for I longed for your commandments. 132 Turn to me, and have mercy on me, as you always do to those who love your name. 133 Establish my footsteps in your word. Don’t let any iniquity have dominion over me. 134 Redeem me from the oppression of man, so I will observe your precepts. 135 Make your face shine on your servant. Teach me your statutes. 136 Streams of tears run down my eyes, because they don’t observe your law." Observations: 119:129-135 The psalmist pants for God's commandments because he sees how wonderful they are. They give guidance, understanding, victory over sin and oppressors. 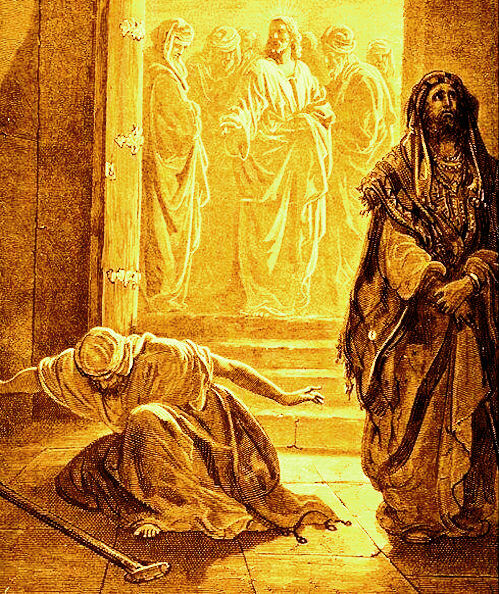 They open the door to God's mercy and presence. In verse 132, “always do” is the Hebrew noun for “judgment” or “ordinance” another reference to God's word. It is sometimes translated “custom.” The point is that God's custom or judgment is to have mercy on those who love His name. Those who don't, miss out. 119:136 As he thinks of the loss of those who don't learn and do things God's way, he actually cries. Application: The more we experience the benefits of God's word, the more we'll crave it. Prayer: All-wise God, Your words make a wonderful difference in my life; thanks for the blessings You give through Your truth. Amen. Pr 29:1 “He who is often rebuked and stiffens his neck will be destroyed suddenly, with no remedy. 2 When the righteous thrive, the people rejoice; but when the wicked rule, the people groan. 3 Whoever loves wisdom brings joy to his father; but a companion of prostitutes squanders his wealth. Observations: 29:1 Those who stubbornly reject rebuke will suffer more than a temporary stiff neck, but will experience sudden destruction. 29:2-3 The righteous and wise cause rejoicing for those around them. A lack of those qualities causes regret. Application: Learn to listen at the low volume and repent, so you and others will have joy rather than grief. Prayer: Father, thanks for the efforts You take to correct me; may I be receptive and righteous; then everybody will be happy. Amen. Luke 18-21 In these final chapters before Jesus goes to the cross He gives His disciples instruction about prayer, faithfulness and suffering, in light of the coming Kingdom. He does a final major miracle to underscore the need to have one's eyes open to the truth. There are differing responses to the truth from the rejection of the rich young ruler and the acceptance of Zacchaeus. The Pharisees spar with Him over a number of issues, and He gives a final parable about the Kingdom, and the events leading up to it. Luke 18:1 "He also spoke a parable to them that they must always pray, and not faint, 2 saying, "There was a judge in a certain city who didn’t fear God, and didn’t respect man. 3 A widow was in that city, and she often came to him, saying, ‘Defend me from my adversary!’ 4 He wouldn’t for a while, but afterward he said to himself, ‘Though I neither fear God, nor respect man, 5 yet because this widow bothers me, I will defend her, or else she will wear me out by her continual coming.’" 6 The Lord said, "Listen to what the unrighteous judge says. 7 Won’t God avenge His chosen ones, who are crying out to Him day and night, and yet (although) He exercises patience with them? 8 I tell you that He will avenge them quickly. Nevertheless, when the Son of Man comes, will He find faith on the earth?" 9 He spoke also this parable to certain people who were convinced of their own righteousness, and who despised all others. 10 "Two men went up into the temple to pray; one was a Pharisee, and the other was a tax collector. 11 The Pharisee stood and prayed to himself like this: ‘God, I thank you, that I am not like the rest of men, extortioners, unrighteous, adulterers, or even like this tax collector. 12 I fast twice a week. I give tithes of all that I get.’ 13 But the tax collector, standing far away, wouldn’t even lift up his eyes to heaven, but beat his breast, saying, ‘God, be merciful to me, a sinner!’ 14 I tell you, this man went down to his house justified rather than the other; for everyone who exalts himself will be humbled, but he who humbles himself will be exalted." 15 They were also bringing their babies to him, that he might touch them. But when the disciples saw it, they rebuked them. 16 Jesus summoned them, saying, "Allow the little children to come to Me, and don’t hinder them, for the Kingdom of God belongs to such as these. 17 Most certainly, I tell you, whoever doesn’t receive the Kingdom of God like a little child, he will in no way enter/possess therein." 18 A certain ruler asked him, saying, "Good Teacher, what shall I do to inherit eternal life?" 19 Jesus asked him, "Why do you call Me good? No one is good, except one—God. 20 You know the commandments: ‘Don’t commit adultery,’ ‘Don’t murder,’ ‘Don’t steal,’ ‘Don’t give false testimony,’ ‘Honor your father and your mother.’" 21 He said, "I have observed all these things from my youth up." 22 When Jesus heard these things, He said to him, "You still lack one thing. Sell all that you have, and distribute it to the poor. You will have treasure in heaven. Come, follow Me." 23 But when he heard these things, he became very sad, for he was very rich. 24 Jesus, seeing that he became very sad, said, "How hard it is for those who have riches to enter into the Kingdom of God! 25 For it is easier for a camel to enter in through a needle’s eye, than for a rich man to enter into the Kingdom of God." 26 Those who heard it said, "Then who can be saved?" 27 But He said, "The things which are impossible with men are possible with God." 28 Peter said, "Look, we have left everything, and followed you." 29 He said to them, "Most certainly I tell you, there is no one who has left house, or wife, or brothers, or parents, or children, for the Kingdom of God’s sake, 30 who will not receive many times more in this time, and in the world to come, eternal life." 31 He took the twelve aside, and said to them, "Behold, we are going up to Jerusalem, and all the things that are written through the prophets concerning the Son of Man will be fulfilled/completed. 32 For He will be delivered up to the Gentiles, will be mocked, treated shamefully, and spit on. 33 They will scourge and kill Him. On the third day, He will rise again." 34 They understood none of these things. This saying was hidden/concealed from them, and they didn’t understand the things that were said. 35 It happened, as He came near Jericho, a certain blind man sat by the road, begging. 36 Hearing a multitude going by, he asked what this meant. 37 They told him that Jesus of Nazareth was passing by. 38 He cried out, "Jesus, You son of David, have mercy on me!" 39 Those who led the way rebuked him, that he should be quiet; but he cried out all the more, "You son of David, have mercy on me!" 40 Standing still, Jesus commanded him to be brought to Him. When he had come near, He asked him, 41 "What do you want me to do?" He said, "Lord, that I may see again." 42 Jesus said to him, "Receive your sight. Your faith has healed/saved you." 43 Immediately he received his sight, and followed Him, glorifying God. All the people, when they saw it, praised God." Observations: 18:1-8 This is another parable whose point is frequently missed. It's not about badgering God (like you're going to wear Him out by adding a few extra requests to the billions that barrage Him every day? ), but about expressing faith and confidence in God's character. It ends with Jesus wondering if the Son of Man will find faith on the earth when He comes. (Hey, another argument that the Kingdom isn't within the hearts of the Pharisees, since the coming of the King is still future.) Jesus contrasts the unrighteous judge with God, the just avenger. If the unjust judge would answer, how much more would the righteous God, who loves to help His people, come to their aid (although sometimes He waits patiently until just the right time)? 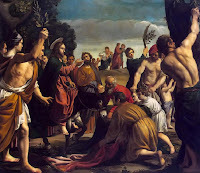 Believers should not faint from their afflictions (note that this understanding of faint is in accord with other NT usages of the word; it's not about badgering or not giving up asking), but should always (as in on all occasions, cf 1 Corinthians 1:4) pray for God's justice to be executed. Note it's not continually demanding “Oh Lord, won't you buy me a Mercedes-Benz” but about getting avenged/justice (relief from oppression). 18:9-14 It's appropriate to thank God for His work in your life in giving you victory over sin, for that glorifies Him. The Pharisee was praising himself (like he's going to impress God) and putting others down to make himself look good to himself. The tax collector humbled himself and confessed the truth (1 John 1:9). He's the kind of person God forgives, and cleanses from all unrighteousness, so he can have fellowship with Himself and others. The exaltation that the Pharisee sought wasn't found in self-promotion, but in self-denial. 18:15-17 The key to this parable is to understand what aspect of a little child Jesus had in mind. Perhaps the previous parable of the proud Pharisee has the clue. 18:18-30 See comments on Matthew 19 and Mark 10 (especially under Digging Deeper there) and Study Guide to Rewards on Truthbase.net to get an accurate understanding of this subject. Note that Jesus corrects the misconception about good, but not about the ruler's goodness. He lacked only one thing (and it wasn't faith in the substitutionary atonement). The man is seeking an inheritance/possessions in the Kingdom; Jesus says self-denial and following as His disciple will give him that, explained as treasure in heaven, saved (as in glorification), and in the world to come (the Kingdom) life/dominion of the Age (see Study Guide for elaboration). The disciples, who had left all to follow Jesus, understood this as a promise of reward. Jesus extends the promise of blessing to all who exchange the temporal for the eternal, but adds a bonus: one also gets back in this live what they've sacrificed to follow Him. This is not about getting sins forgiven. 18:31-34 The disciples were probably giddy with the prospect of their future good fortune, so when Jesus explains His prophesied rejection, they couldn't see it (like the blind guy in the next verses). Their experience with Jesus was such that He could do or escape anything, so how could He be captured and killed? This is a great passage to see that truth is based upon revelation, not experience. The revealed will of God supersedes experience, regardless of how real it is. Remember, reality is but one part of understanding truth, revelation and reason must also coincide. The solution was to shift their paradigm to the promises being future, after the pain. As in Mark, Jesus teaches that the route to the prophesied glory was via the prophesied suffering. Application: Our purpose and perspectives in life need to based upon the objective realities that God has revealed, not our subjective experience of it. Prayer: God, please open my eyes to the truth as You've revealed it, so that I may walk in it, to Your glory. Amen. 19:1 "He entered and was passing through Jericho. 2 There was a man named Zacchaeus. He was a chief tax collector, and he was rich. 3 He was trying to see who Jesus was, and couldn’t because of the crowd, because he was short. 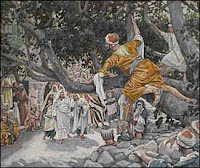 4 He ran on ahead, and climbed up into a sycamore tree to see Him, for he was to pass that way. 5 When Jesus came to the place, He looked up and saw him, and said to him, "Zacchaeus, hurry and come down, for today I must stay at your house." 6 He hurried, came down, and received Him joyfully. 7 When they saw it, they all murmured, saying, "He has gone in to lodge with a man who is a sinner." 8 Zacchaeus stood and said to the Lord, "Behold, Lord, half of my goods I give to the poor. If I have wrongfully exacted anything of anyone, I restore four times as much." 9 Jesus said to him, "Today, salvation has come to this house, because he also is a son of Abraham. 10 For the Son of Man came to seek and to save that which was lost." 11 As they heard these things, He went on and told a parable, because He was near Jerusalem, and they supposed that the Kingdom of God would be revealed immediately. 12 He said therefore, "A certain nobleman went into a far country to receive for himself a kingdom, and to return. 13 He called ten servants of his, and gave them ten mina coins, and told them, ‘Conduct business until I come.’ 14 But his citizens hated him, and sent an envoy after him, saying, ‘We don’t want this man to reign over us.’ 15 "It happened when he had come back again, having received the kingdom, that he commanded these servants, to whom he had given the money, to be called to him, that he might know what they had gained by conducting business. 16 The first came before him, saying, ‘Lord, your mina has made ten more minas.’ 17 "He said to him, ‘Well done, you good servant! Because you were found faithful with very little, you shall have authority over ten cities.’ 18 "The second came, saying, ‘Your mina, Lord, has made five minas.’ 19 "So he said to him, ‘And you are to be over five cities.’ 20 Another came, saying, ‘Lord, behold, your mina, which I kept laid away in a handkerchief, 21 for I feared you, because you are an exacting man. You take up that which you didn’t lay down, and reap that which you didn’t sow.’ 22 "He said to him, ‘Out of your own mouth will I judge you, you wicked servant! You knew that I am an exacting man, taking up that which I didn’t lay down, and reaping that which I didn’t sow. 23 Then why didn’t you deposit my money in the bank, and at my coming, I might have earned interest on it?’ 24 He said to those who stood by, ‘Take the mina away from him, and give it to him who has the ten minas.’ 25 "They said to him, ‘Lord, he has ten minas!’ 26 ’For I tell you that to everyone who has, will more be given; but from him who doesn’t have, even that which he has will be taken away from him. 27 But bring those enemies of mine who didn’t want me to reign over them here, and kill them before me.’"
28 Having said these things, He went on ahead, going up to Jerusalem. 29 It happened, when He drew near to Bethsphage and Bethany, at the mountain that is called Olivet, He sent two of his disciples, 30 saying, "Go your way into the village on the other side, in which, as you enter, you will find a colt tied, whereon no man ever yet sat. Untie it, and bring it. 31 If anyone asks you, ‘Why are you untying it?’ say to him: ‘The Lord needs it.’" 32 Those who were sent went away, and found things just as He had told them. 33 As they were untying the colt, its owners said to them, "Why are you untying the colt?" 34 They said, "The Lord needs it." 35 They brought it to Jesus. They threw their cloaks on the colt, and set Jesus on them. 36 As He went, they spread their cloaks in the way. 37 As He was now getting near, at the descent of the Mount of Olives, the whole multitude of the disciples began to rejoice and praise God with a loud voice for all the mighty works which they had seen, 38 saying, "Blessed is the King who comes in the name of the Lord! Peace in heaven, and glory in the highest!" 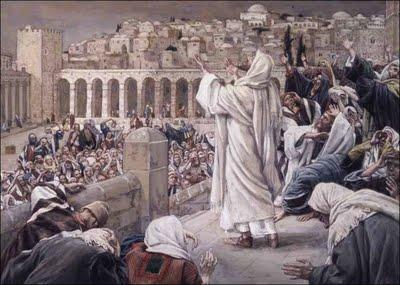 39 Some of the Pharisees from the multitude said to him, "Teacher, rebuke your disciples!" 40 He answered them, "I tell you that if these were silent, the stones would cry out." 41 When He drew near, he saw the city and wept over it, 42 saying, "If you, even you, had known today the things which belong to/bring your peace! But now, they are hidden from your eyes. 43 For the days will come on you, when your enemies will throw up a barricade against you, surround you, hem you in on every side, 44 and will dash you and your children within you to the ground. They will not leave in you one stone on another, because you didn’t know the time of your visitation." 45 He entered into the temple, and began to drive out those who bought and sold in it, 46 saying to them, "It is written, ‘My house is a house of prayer,’ but you have made it a ‘den of robbers’!" 47 He was teaching daily in the temple, but the chief priests and the scribes and the leading men among the people sought to destroy Him. 48 They couldn’t find what they might do, for all the people hung on to every word that He said. Observations: 19:1-10 Zacchaeus was a wee little man who did what was necessary to see Jesus. Jesus sees him, and invites Himself to his house. 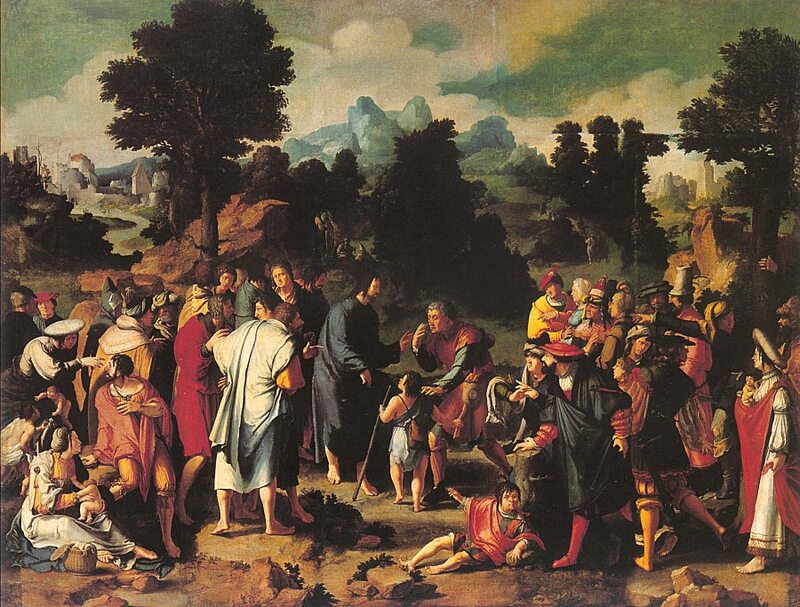 Zach obeys the summons, and vows to give half his goods to the poor and make fourfold restitution (as the law required - Exodus 22:1) for any money wrongfully extracted (the first-class condition assumes this to be a true state of affairs). This is not what the rich young ruler did in the previous chapter, and indicates that what is impossible from a human perspective is indeed possible with God. 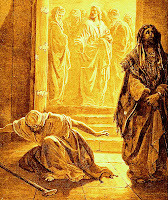 The Son of Man responds that “salvation” has come to Zach's house, and that He is a son of Abraham. As a tax collector, He would have been kicked out of the synagogue and denied the son of Abraham status by the other Jews. This is not “forgiveness salvation” (justification by faith in Jesus' vicarious death), but that of glorification, which results from sanctification and righteous living. 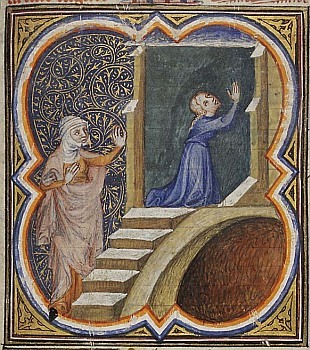 The following parable of the minas reinforces this interpretation. God rewards those who repent and live for their reward in the Kingdom, exchanging what they have in this life for an eternal blessing. Verse 10 is a good summary statement of the theme of Luke. God, in Christ, seeks and saves the lost. 19:11-27 Jesus tells the next parable to show that the Kingdom coming from God, promised in the OT, was not yet here, nor would be revealed immediately. The approach of the King to His throne in Jerusalem would lead many to expect that Jesus would now occupy David's throne and fulfill the OT promises. See comments on the parable of the talents in Matthew 25. Jesus is the noblemen who goes away to heaven to have the kingdom conferred upon Him and then return. 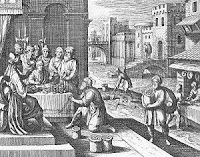 All the Jewish kings at the time had to go to Rome to have the right to rule Jerusalem conferred upon them. (Herod Archelaus (see chart under Digging Deeper) had a delegation oppose his confirmation). When the nobleman returns to set up the kingdom, he will demand an accounting of his servants. Each servant was given the same amount from the lord's treasury, and told to conduct business (a common word for trading). They needed to take what the lord had given them and gain a profit with it. The first servant increased his one mina 10 times (1000%) of his money, and received a commendation for his faithfulness, as well as authority/rulership over ten cities. The second was rewarded proportionately to what he had gained. Five cities was less than ten, and the commendation was missing. The last servant, the wicked servant, did nothing with what he was given and thus when judged, had what he was given taken from him. 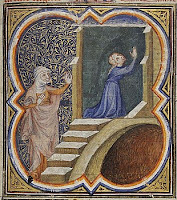 In Matthew 25:39 the unprofitable servant is tossed into outer darkness, excluded from Kingdom blessings (see comments there). Note that in verse 27 the unprofitable servant is distinguished from the enemies, and does not share their fate. As a servant, entrusted with his master's goods, he would have been represented in Jesus' audience by a forgiven, but unfaithful, Jew whose sins were covered by participation in the Day of Atonement. The enemies would have been those with no relationship with God, nor access to the Levitical sacrificial system. Although one wants to avoid making a parable walk on all fours (every item has a point of contact with reality), there is a question that arises and an answer worth pondering. What was given to the servants? 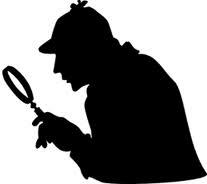 So let's put on our deerstalkers (Sherlock hats) and observe what was written, and then scratch under our hats and see what makes the most sense. So what do you think they represent? A couple of cross references might apply (Acts 1:8; Psalm 51:11; 1 Thessalonians 5:19). We'll see that the Holy Spirit, the Spirit of glory, is the power source for doing God's will (Philippians 2:13), and that believers have been given the first installment the HS (Ephesians 1:13) implying that there is more to come. Being stripped of glory, or deposed from ruling, was a common fate of unfaithful vassals in Biblical times. Would an infinitely just God give glory to those who rebel and disobey (hint: see Genesis 3:7 and 2 Corinthians 5:3)? We'll see this theme again, so keep thinking about it; you might need to rearrange a paradigm or two. 19:28-40 See Matthew 21 for the triumphal entry observations. Note that the praise is for the things they had seen Jesus do. Where were these people when Pilate offered to free Jesus or Barabbas? 19:41-48 Like Jeremiah, Jesus laments over the destruction of the city which failed to recognize what would bring the promised Messianic blessing of peace. Psalms 29:11 "Yahweh will give strength to His people; Yahweh will bless His people with peace." Only Luke records the prediction of Jerusalem's destruction, which was accomplished by Titus in AD70. They failed to accept the visit of the King. Jesus went to the temple, kicked out the money changers, taught the people, and incurred the ire of the establishment (see comments on Matthew 21). Application: How can you use what God has entrusted to you to further His purposes and hear the words: “Well done; good, and faithful servant!”? Prayer: God, show me how to live so that You are pleased with me and can bless me; may I use all You've given me for Your purposes and glory. Amen. Luke 20 Will You Be Considered Worthy? 20:1 It happened on one of those days, as He was teaching the people in the temple and preaching the Good News/gospel, that the priests and scribes came to Him with the elders. 2 They asked Him, "Tell us: by what authority do you do these things? Or who is giving you this authority?" 3 He answered them, "I also will ask you one question. Tell me: 4 the baptism of John, was it from heaven, or from men?" 5 They reasoned with themselves, saying, "If we say, ‘From heaven,’ He will say, ‘Why didn’t you believe him?’ 6 But if we say, ‘From men,’ all the people will stone us, for they are persuaded that John was a prophet." 7 They answered that they didn’t know where it was from. 8 Jesus said to them, "Neither will I tell you by what authority I do these things." 9 He began to tell the people this parable. "A man planted a vineyard, and rented it out to some farmers, and went into another country for a long time. 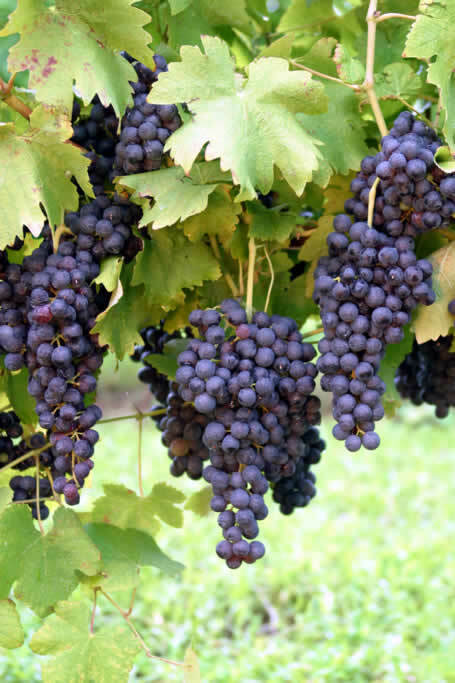 10 At the proper season, he sent a servant to the farmers to collect his share of the fruit of the vineyard. But the farmers beat him, and sent him away empty. 11 He sent yet another servant, and they also beat him, and treated him shamefully, and sent him away empty. 12 He sent yet a third, and they also wounded him, and threw him out. 13 The lord of the vineyard said, ‘What shall I do? I will send my beloved son. It may be that seeing him, they will respect him.’ 14 "But when the farmers saw him, they reasoned among themselves, saying, ‘This is the heir. Come, let’s kill him, that the inheritance may be ours.’ 15 They threw him out of the vineyard, and killed him. What therefore will the lord of the vineyard do to them? 16 He will come and destroy these farmers, and will give the vineyard to others." When they heard it, they said, "May it never be!" 17 But He looked at them, and said, "Then what is this that is written, ‘The stone which the builders rejected, the same was made the chief cornerstone?’ 18 Everyone who falls on that stone will be broken to pieces, but it will crush whomever it falls on to dust." 19 The chief priests and the scribes sought to lay hands on Him that very hour, but they feared the people—for they knew He had spoken this parable against them. 20 They watched Him, and sent out spies, who pretended to be righteous, that they might trap Him in something He said, so as to deliver Him up to the power and authority of the governor. 21 They asked Him, "Teacher, we know that you say and teach what is right, and aren’t partial to anyone, but truly teach the way of God. 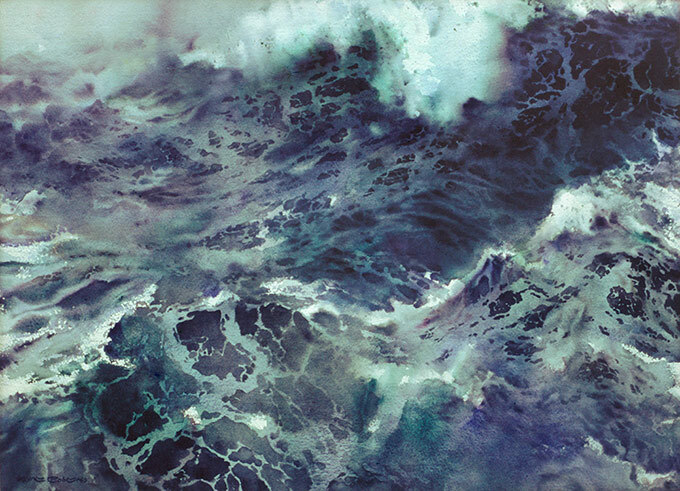 22 Is it lawful for us to pay taxes to Caesar, or not?" 23 But He perceived their craftiness, and said to them, "Why do you test Me? 24 Show Me a denarius. Whose image and inscription are on it?" They answered, "Caesar’s." 25 He said to them, "Then give to Caesar the things that are Caesar’s, and to God the things that are God’s." 26 They weren’t able to trap Him in his words before the people. They marveled at His answer, and were silent. 27 Some of the Sadducees came to Him, those who deny that there is a resurrection. 28 They asked Him, "Teacher, Moses wrote to us that if a man’s brother dies having a wife, and he is childless, his brother should take the wife, and raise up children for his brother. 29 There were therefore seven brothers. The first took a wife, and died childless. 30 The second took her as wife, and he died childless. 31 The third took her, and likewise the seven all left no children, and died. 32 Afterward the woman also died. 33 Therefore in the resurrection whose wife of them will she be? For the seven had her as a wife." 34 Jesus said to them, "The children of this age marry, and are given in marriage. 35 But those who are considered worthy to attain to that age and the resurrection from the dead, neither marry, nor are given in marriage. 36 For they can’t die any more, for they are like the angels, and are children of God, being children of the resurrection. 37 But that the dead are raised, even Moses showed at the bush, when he called the Lord ‘The God of Abraham, the God of Isaac, and the God of Jacob.’ 38 Now he is not the God of the dead, but of the living, for all are alive to Him." 39 Some of the scribes answered, "Teacher, you speak well." 40 They didn’t dare to ask Him any more questions. 41 He said to them, "Why do they say that the Christ is David’s son? 42 David himself says in the book of Psalms, ‘The Lord said to my Lord, "Sit at My right hand, 43 until I make Your enemies the footstool of Your feet. "’ 44 "David therefore calls Him Lord, so how is he his son?" 45 In the hearing of all the people, He said to His disciples, 46 "Beware of the scribes, who like to walk in long robes, and love greetings in the marketplaces, the best seats in the synagogues, and the best places at feasts; 47 who devour widows’ houses, and for a pretense make long prayers: these will receive greater condemnation." Observations: 20:1-47 This chapter matches Matthew 21 (please see comments there) very closely, except for the passage below. 20:35-36 These verses have some unique and important information. The word “age” (aion, Strongs #165) is the same as that in verse 34. This is the word frequently and incorrectly translated “eternal,” yet here it obviously refers to a distinct period of time (as it was used by all classical authors; Plato would also use it for an indefinite period). Here aion refers to the Messianic age as a distinct period of time, meaning the Millennial Kingdom. The second point to notice is that “worthy” (Strongs #2661) also used only in 21:36 and two other suffering for reward passages (Acts 5:41; 2 Thessalonians 1:5), is a requirement for resurrection and participation in that Kingdom. In the next chapter worthiness is a function of being on prayerful guard against temptation (Matthew 26:41; Mark 14:38), with the result of standing (rather than being destroyed in judgment) before the Son of Man, for receiving blessing (Psalm 1:5). Luke 21:36 "Watch therefore, and pray always, that you may be accounted worthy <2661> to escape all these things that shall come to pass, and to stand before the Son of man." “Attain” is used of “hitting the mark” a conceptual opposite of one of the words for sin, which is “missing the mark.” God's desire is to display His glory in rewarding (sharing His glory with) faithful believers (we'll see this in the epistles, eg, 1 Peter 1), and He prepared them for this goal. He provides the resources for hitting the goal, which are accessed by prayer and implemented by watchfulness. Worthiness is not an automatic result of justification, otherwise prayer and watchfulness in overcoming temptation wouldn't be necessary (nor would enduring to the end). Application: Ensure your worthiness by aiming at the goal of receiving commendation rather than condemnation. Prayer: Heavenly Father, like Jesus, may I love Your approval more than that of men, and give You all that is Yours, including my heart. Amen. 21:1 He looked up, and saw the rich people who were putting their gifts into the treasury. 2 He saw a certain poor widow casting in two small brass coins. 3 He said, "Truly I tell you, this poor widow put in more than all of them, 4 for all these put in gifts for God from their abundance, but she, out of her poverty, put in all that she had to live on." 7 They asked him, "Teacher, so when will these things be? What is the sign that these things are about to happen?" 8 He said, "Watch out that you don’t get led astray, for many will come in my name, saying, ‘I am he,’ and, ‘The time is at hand.’ Therefore don’t follow them. 9 When you hear of wars and disturbances, don’t be terrified, for these things must happen first, but the end won’t come immediately." 10 Then he said to them, "Nation will rise against nation, and kingdom against kingdom. 11 There will be great earthquakes, famines, and plagues in various places. There will be terrors and great signs from heaven. 12 But before all these things, they will lay their hands on you and will persecute you, delivering you up to synagogues and prisons, bringing you before kings and governors for my name’s sake. 13 It will turn out as a testimony for you. 14 Settle it therefore in your hearts not to meditate beforehand how to answer, 15 for I will give you a mouth and wisdom which all your adversaries will not be able to withstand or to contradict. 16 You will be betrayed even by parents, brothers, relatives, and friends. They will cause some of you to be put to death. 17 You will be hated by all men for my name’s sake. 18 And not a hair of your head will perish. 19 "By your endurance you will win/possess/acquire your lives/souls. 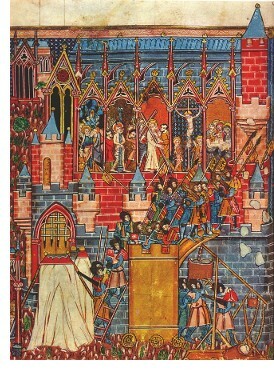 20 "But when you see Jerusalem surrounded by armies, then know that its desolation is at hand. 21 Then let those who are in Judea flee to the mountains. Let those who are in the midst of her depart. Let those who are in the country not enter therein. 22 For these are days of vengeance, that all things which are written may be fulfilled. 23 Woe to those who are pregnant and to those who nurse infants in those days! For there will be great distress in the land, and wrath to this people. 24 They will fall by the edge of the sword, and will be led captive into all the nations. Jerusalem will be trampled down by the Gentiles, until the times of the Gentiles are fulfilled. 25 There will be signs in the sun, moon, and stars; and on the earth anxiety of nations, in perplexity for the roaring of the sea and the waves; 26 men fainting for fear, and for expectation of the things which are coming on the world: for the powers of the heavens will be shaken. 27 Then they will see the Son of Man coming in a cloud with power and great glory. 28 But when these things begin to happen, look up, and lift up your heads, because your redemption is near." 29 He told them a parable. "See the fig tree, and all the trees. 30 When they are already budding, you see it and know by your own selves that the summer is already near. 31 Even so you also, when you see these things happening, know that the Kingdom of God is near. 32 Most certainly I tell you, this generation will not pass away until all things are accomplished. 33 Heaven and earth will pass away, but my words will by no means pass away. 34 "So be careful, or your hearts will be loaded down with carousing, drunkenness, and cares of this life, and that day will come on you suddenly. 35 For it will come like a snare on all those who dwell on the surface of all the earth. 36 Therefore be watchful all the time, praying that you may be counted worthy to escape all these things that will happen, and to stand before the Son of Man." 37 Every day Jesus was teaching in the temple, and every night he would go out and spend the night on the mountain that is called Olivet. 38 All the people came early in the morning to him in the temple to hear him. Observations: 21:1-4 See comments on Mark 12:41 for the widow's giving, which led to comments on the destruction of the temple. 21:7-38 The disciples ask “when” and “what”. Jesus warns them not to be deceived and led astray, and list the things which must occur before He returns, which are still future. See the comments on Jesus' discourse on the Mount of Olives in Matthew 24, and Mark 13 for comments. Luke expands a little more on the magnitude of the geopolitical changes. 21:16-19 These paradoxical statements need to be reconciled. How can someone be betrayed and put do death, yet have not a hair of their head perish? The word for “perish” is translated “lost” in the parables of the lost sheep, coin, and son in chapter 15. In 9:24 and 17:33 Jesus said a disciple had to “lose” his life/soul in order to save it, in the sense of exchanging it for eternal reward. That sense fits this context, and verse 20. They might die, but the hair on their head (put for all of their life) would be saved through resurrection and reward. By their faithful endurance or perseverance under persecution, they would acquire or save their souls. “He who endures to the end will be saved” is how Mark 13:13 expresses the same concept in the same context. 21:24 This is a comment unique to Luke, the Gentile gospel. The “times of the Gentiles” will occur when they rule over Jerusalem, and the Jews are scattered among all nations. Daniel's interpretation of Nebuchadnezzar's 2:34-35, 44-45 speak to such a time. 21:28 When the Son of Man comes in His glory, redemption draws near. This is not individual redemption which is a present possession of those who trust In Christ's atoning sacrifice as payment for their sins (Rom 3:24; Col 1:14), and probably not that of the body in glorification/adoption (Rom 8:23), but more likely that of the nation. See Ephesians 1:7 & 14 for the individual and corporate senses of redemption. 21:32 The “generation” could refer to those listening to Jesus, in which case Jesus' teaching was false and not fulfilled. Some think it refers to those who are alive when the events start happeing. A legitimate meaning that takes into account all the data in the chapter is that of “the common descendants” or the Jewish nation, to whom the Kingdom was promised. See comments on Matthew 24:34. 21:34-36 Jesus gives the escape plan to avoid the Tribulation that is coming (see Application below). Application: Be holy, on guard, and prayerfully dependent, and you'll be counted worthy to stand in the presence of the Son of Man when He comes in His glory. Prayer: Lord, I know that Your words won't pass away; may I live so that I will be counted worthy of all the blessings You've promised those loyal to You. Amen. God in a nutshell: God is the just judge who desires to help and avenge the oppression of His people. He allows His servants to suffer sometimes, but make it up to them in the end. He will also execute justice in a negative sense upon those who repeatedly reject Him. Build-a-Jesus: Jesus laments over those who will suffer because of their refusal to respond to Him. He is the nobleman who entrusts His servants with a stewardship and responsibility, and will return to see how they've obeyed. Us in a nutshell: We need to be on our guard and dependently pray so we are worthy of the blessings God has planned for His faithful servants, and can escape the judgments of the unrighteous. If we don't we will go astray and lose out. There is a time to stay and a time to flee. Those who are sensitive to God's will, will know what to do when. 18:1 He also spoke a parable to them that they must always pray, and not give up, 2 saying, "There was a judge in a certain city who didn’t fear God, and didn’t respect man. 3 A widow was in that city, and she often came to him, saying, ‘Defend me from my adversary!’ 4 He wouldn’t for a while, but afterward he said to himself, ‘Though I neither fear God, nor respect man, 5 yet because this widow bothers me, I will defend her, or else she will wear me out by her continual coming.’" 6 The Lord said, "Listen to what the unrighteous judge says. 7 Won’t God avenge his chosen ones, who are crying out to him day and night, and yet he exercises patience with them? 8 I tell you that he will avenge them quickly. Nevertheless, when the Son of Man comes, will he find faith on the earth?" 15 They were also bringing their babies to him, that he might touch them. But when the disciples saw it, they rebuked them. 16 Jesus summoned them, saying, "Allow the little children to come to me, and don’t hinder them, for the Kingdom of God belongs to such as these. 17 Most certainly, I tell you, whoever doesn’t receive the Kingdom of God like a little child, he will in no way enter into it." 18 A certain ruler asked him, saying, "Good Teacher, what shall I do to inherit eternal life?" 19 Jesus asked him, "Why do you call me good? No one is good, except one—God. 20 You know the commandments: ‘Don’t commit adultery,’ ‘Don’t murder,’ ‘Don’t steal,’ ‘Don’t give false testimony,’ ‘Honour your father and your mother.’" 21 He said, "I have observed all these things from my youth up." 22 When Jesus heard these things, he said to him, "You still lack one thing. Sell all that you have, and distribute it to the poor. You will have treasure in heaven. Come, follow me." 23 But when he heard these things, he became very sad, for he was very rich. 24 Jesus, seeing that he became very sad, said, "How hard it is for those who have riches to enter into the Kingdom of God! 25 For it is easier for a camel to enter in through a needle’s eye, than for a rich man to enter into the Kingdom of God." 26 Those who heard it said, "Then who can be saved?" 27 But he said, "The things which are impossible with men are possible with God." 28 Peter said, "Look, we have left everything, and followed you." 29 He said to them, "Most certainly I tell you, there is no one who has left house, or wife, or brothers, or parents, or children, for the Kingdom of God’s sake, 30 who will not receive many times more in this time, and in the world to come, eternal life." 31 He took the twelve aside, and said to them, "Behold, we are going up to Jerusalem, and all the things that are written through the prophets concerning the Son of Man will be completed. 32 For he will be delivered up to the Gentiles, will be mocked, treated shamefully, and spit on. 33 They will scourge and kill him. On the third day, he will rise again." 34 They understood none of these things. This saying was hidden from them, and they didn’t understand the things that were said. 35 It happened, as he came near Jericho, a certain blind man sat by the road, begging. 36 Hearing a multitude going by, he asked what this meant. 37 They told him that Jesus of Nazareth was passing by. 38 He cried out, "Jesus, you son of David, have mercy on me!" 39 Those who led the way rebuked him, that he should be quiet; but he cried out all the more, "You son of David, have mercy on me!" 40 Standing still, Jesus commanded him to be brought to him. When he had come near, he asked him, 41 "What do you want me to do?" He said, "Lord, that I may see again." 42 Jesus said to him, "Receive your sight. Your faith has healed you." 43 Immediately he received his sight, and followed him, glorifying God. All the people, when they saw it, praised God. 19:1 He entered and was passing through Jericho. 2 There was a man named Zacchaeus. He was a chief tax collector, and he was rich. 3 He was trying to see who Jesus was, and couldn’t because of the crowd, because he was short. 4 He ran on ahead, and climbed up into a sycamore tree to see him, for he was to pass that way. 5 When Jesus came to the place, he looked up and saw him, and said to him, "Zacchaeus, hurry and come down, for today I must stay at your house." 6 He hurried, came down, and received him joyfully. 7 When they saw it, they all murmured, saying, "He has gone in to lodge with a man who is a sinner." 8 Zacchaeus stood and said to the Lord, "Behold, Lord, half of my goods I give to the poor. If I have wrongfully exacted anything of anyone, I restore four times as much." 9 Jesus said to him, "Today, salvation has come to this house, because he also is a son of Abraham. 10 For the Son of Man came to seek and to save that which was lost." 41 When he drew near, he saw the city and wept over it, 42 saying, "If you, even you, had known today the things which belong to your peace! But now, they are hidden from your eyes. 43 For the days will come on you, when your enemies will throw up a barricade against you, surround you, hem you in on every side, 44 and will dash you and your children within you to the ground. They will not leave in you one stone on another, because you didn’t know the time of your visitation." 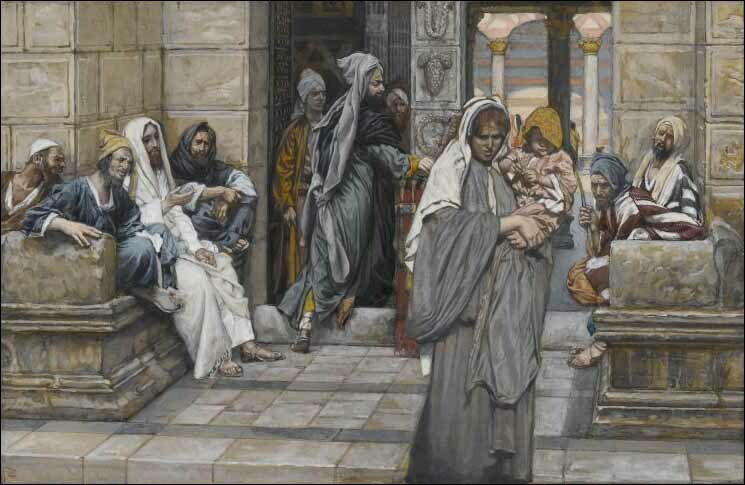 45 He entered into the temple, and began to drive out those who bought and sold in it, 46 saying to them, "It is written, ‘My house is a house of prayer,’ but you have made it a ‘den of robbers’!" 47 He was teaching daily in the temple, but the chief priests and the scribes and the leading men among the people sought to destroy him. 48 They couldn’t find what they might do, for all the people hung on to every word that he said. 20:1 It happened on one of those days, as he was teaching the people in the temple and preaching the Good News, that the priests and scribes came to him with the elders. 2 They asked him, "Tell us: by what authority do you do these things? Or who is giving you this authority?" 3 He answered them, "I also will ask you one question. Tell me: 4 the baptism of John, was it from heaven, or from men?" 5 They reasoned with themselves, saying, "If we say, ‘From heaven,’ he will say, ‘Why didn’t you believe him?’ 6 But if we say, ‘From men,’ all the people will stone us, for they are persuaded that John was a prophet." 7 They answered that they didn’t know where it was from. 8 Jesus said to them, "Neither will I tell you by what authority I do these things." 20 They watched him, and sent out spies, who pretended to be righteous, that they might trap him in something he said, so as to deliver him up to the power and authority of the governor. 21 They asked him, "Teacher, we know that you say and teach what is right, and aren’t partial to anyone, but truly teach the way of God. 22 Is it lawful for us to pay taxes to Caesar, or not?" 23 But he perceived their craftiness, and said to them, "Why do you test me? 24 Show me a denarius. Whose image and inscription are on it?" They answered, "Caesar’s." 25 He said to them, "Then give to Caesar the things that are Caesar’s, and to God the things that are God’s." 26 They weren’t able to trap him in his words before the people. They marvelled at his answer, and were silent. 27 Some of the Sadducees came to him, those who deny that there is a resurrection. 28 They asked him, "Teacher, Moses wrote to us that if a man’s brother dies having a wife, and he is childless, his brother should take the wife, and raise up children for his brother. 29 There were therefore seven brothers. The first took a wife, and died childless. 30 The second took her as wife, and he died childless. 31 The third took her, and likewise the seven all left no children, and died. 32 Afterward the woman also died. 33 Therefore in the resurrection whose wife of them will she be? For the seven had her as a wife." 34 Jesus said to them, "The children of this age marry, and are given in marriage. 35 But those who are considered worthy to attain to that age and the resurrection from the dead, neither marry, nor are given in marriage. 36 For they can’t die any more, for they are like the angels, and are children of God, being children of the resurrection. 37 But that the dead are raised, even Moses showed at the bush, when he called the Lord ‘The God of Abraham, the God of Isaac, and the God of Jacob.’ 38 Now he is not the God of the dead, but of the living, for all are alive to him." 39 Some of the scribes answered, "Teacher, you speak well." 40 They didn’t dare to ask him any more questions. 41 He said to them, "Why do they say that the Christ is David’s son? 42 David himself says in the book of Psalms, ‘The Lord said to my Lord, "Sit at my right hand, 43 until I make your enemies the footstool of your feet. "’ 44 "David therefore calls him Lord, so how is he his son?" 45 In the hearing of all the people, he said to his disciples, 46 "Beware of the scribes, who like to walk in long robes, and love greetings in the marketplaces, the best seats in the synagogues, and the best places at feasts; 47 who devour widows’ houses, and for a pretence make long prayers: these will receive greater condemnation." 5 As some were talking about the temple and how it was decorated with beautiful stones and gifts, he said, 6 "As for these things which you see, the days will come, in which there will not be left here one stone on another that will not be thrown down." 7 They asked him, "Teacher, so when will these things be? What is the sign that these things are about to happen?" 8 He said, "Watch out that you don’t get led astray, for many will come in my name, saying, ‘I am he,’ and, ‘The time is at hand.’ Therefore don’t follow them. 9 When you hear of wars and disturbances, don’t be terrified, for these things must happen first, but the end won’t come immediately." 10 Then he said to them, "Nation will rise against nation, and kingdom against kingdom. 11 There will be great earthquakes, famines, and plagues in various places. There will be terrors and great signs from heaven. 12 But before all these things, they will lay their hands on you and will persecute you, deliveringyou up to synagogues and prisons, bringing you before kings and governors for my name’s sake. 13 It will turn out as a testimony for you. 14 Settle it therefore in your hearts not to meditate beforehand how to answer, 15 for I will give you a mouth and wisdom which all your adversaries will not be able to withstand or to contradict. 16 You will be handed over even by parents, brothers, relatives, and friends. They will cause some of you to be put to death. 17 You will be hated by all men for my name’s sake. 18 And not a hair of your head will perish. 19 "By your endurance you will win your lives.